- Hey, Fred. Have you seen the girl in the corner? 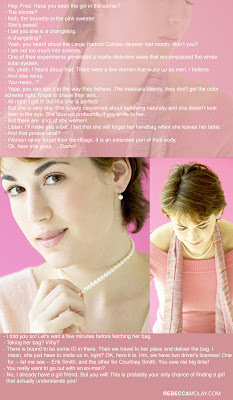 - Nah, the brunette in the pink sweater. - I bet you she is a changeling. - Yeah, you heard about the Large Hadron Collider disaster last month, didn't you? - I am not too much into science. - One of their experiments generated a reality distortion wave that encompassed the whole solar system. - Ah, yeah, I heard about that. There were a few women that woke up as men, I believe. - All right! I get it! But this one is perfect! - But she is very shy. She is very concerned about behaving naturally and she doesn't look men in the eye. She blushes profoundly if you smile at her. - But there are a lot of shy women! - Listen. I'll make you a bet. I bet that she will forget her handbag when she leaves her table. - And that proves what? - Women never forget their handbags. It is an extended part of their body. - Ok. Here she goes..... Damn! - I told you so! Let's wait a few minutes before fetching her bag. - Taking her bag? Why? - There is bound to be some ID in there. Then we travel to her place and deliver the bag. I mean, she just have to invite us in, right? OK, here it is. Hm, we have two driver's licenses! One for -- let me see -- Erik Smith, and the other for Courtney Smith. You owe me big time! - You really want to go out with an ex-man? - No, I already have a girl friend. But you will! This is probably your only chance of finding a girl that actually understands you! This one is for Courtney!